Despite the pain of the shutdown, "it will pay off in the long run,” said Susan Docherty, head of U.S. sales operations for GM. "This will let us focus our limited resources where they’ll serve us best,” Docherty added. She acknowledged that the once-seemingly omnipotent General Motors simply couldn’t keep spending billions to develop so many different products for so many different brands, and then invest the additional money needed to market them. 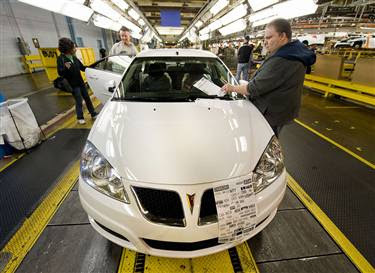 One of the final 2010 Pontiac G6 sedans moves down the line at General Motors Orion assembly plant last week in Michigan. The production marked the end of the line for the venerable Pontiac nameplate (msnbc.com). Over spending on development of multiple (and unnecessary) products, then spending exorbitant sums of money to market them are largely avoided through listening to our community of designers, engineers, and consumers from the earliest stages of vehicle development to develop only the vehicles of the utmost desire, using as many existing components off the shelf across multiple platforms; then executing sales and marketing through the channels of that community, branching out to the outer limits by simply being as visible as possible in local car enthusiast communities both in the virtual and physical worlds. The death of such an iconic brand is an avoidable one had the voice of the muscle car community surrounding the Pontiac brand that started in the 1960's and 1970's around such legendary cars like the GTO and the Firebird been allowed to truly guide the brand responsible for "building excitement." Sure, there were many factors driving the "end" of the Muscle Car Era, but that spirit could have not only lived on, but been well executed in the forms of other vehicles consumers would feel connected to, and as a result prevent the death of such an icon in automotive history. It's these types of lessons learned from our automotive manufacturing counterparts that the engineering team here at Local Motors will strive to keep at the forefront of our minds as we deliver exciting vehicles to the underserved car loving communities of the world such that we don't suffer a similar fate. GM announced that it would phase out the Pontiac brand by the end of 2010 and focus on four core brands in North America as well.